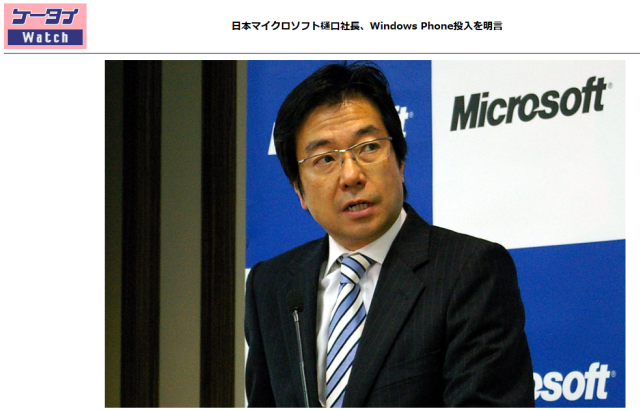 Windows Phone will be coming to Japan by the end of the year according to Yasuyuki Higuchi, corporate president of Microsoft Japan. When WP7 launches in Japan, there will be many market-specific applications which will include games, entertainment, shopping, and travel applications. More importantly, the phone will need to support Japanese characters (e.g. Kanji). No hardware launch partners have been announced but it is assumed that Fujitsu will be involved in some fashion. Android and IOS support multilanguage out of box. My WM6 supports Japanese thru a cludge which I have to experiment with every version (since PPC2002) to get support. So WP7 doesn't bother to fix this? Andriod's finally getting most of the apps I can't live without on WM6. Guess what my next phone WON'T be?